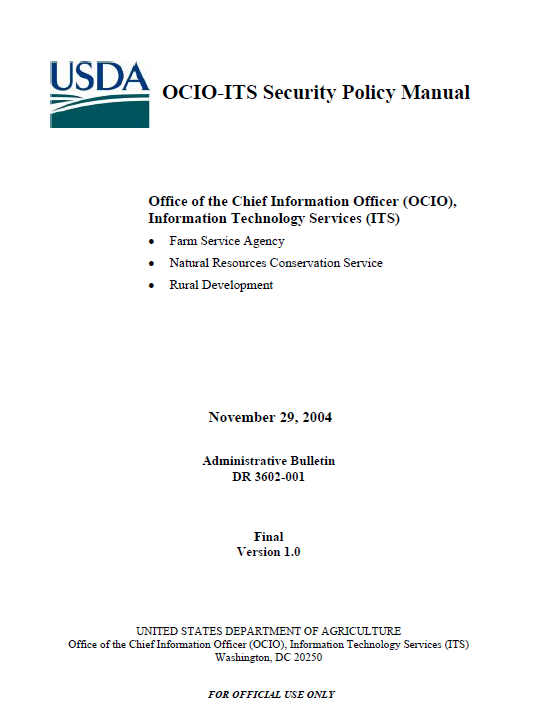 This policy manual establishes policy for the management and administration of information technologies for the United States Department of Agriculture (USDA) Office of the Chief Information Officer (OCIO), Information Technology Services (ITS) that supports the Farm Service Agency (FSA), Natural Resources Conservation Service (NRCS), and Rural Development (RD) including Large Offices (Beltsville, Fort Collins, Fort Worth, Kansas City, Lincoln, Portland, Salt Lake, St. Louis, and Washington D.C. — hereafter referred to as “Large Offices”) and Service Centers (including State, District, Area, County, and Local Field Service Offices — hereafter referred to as “Field Offices”), and their partners. lenders, realtors, growers associations, and agriculture industry groups. the guidelines defined in this policy. OFFICIAL USE ONLY at the bottom. abbreviation FOUO in parentheses at the beginning of the FOUO portion. assurance that unauthorized persons do not gain access. minimum in a locked desk, file cabinet, bookcase, locked room, or similar place. or, for bulk shipments, via fourth class mail. a specific target audience and the information is encrypted. need for more careful protection.